Shh. Listen. There’s a world of sound around you. The ring of laughter. The murmur of voices. Tchaikovsky. The boom of Brubeck or Bach. Wollensak tape recorders are built for this world; to capture and play back — with unerring fidelity —the sounds you care most about. Turn on a Wollensak. Listen. Bass notes are deep, full. Treble notes are bell-clear, distinct. Wollensak tape recorders are solid-state, run cooler, last longer. Wollensak tape recorders are simple to operate. All controls are centrally located, power activated. They start, stop and rewind tape . . . gently and smoothly. There is a Wollensak tape recorder for every budget and taste… including cassette port- ables, AC-DC portables, monaural models, stereophonic models. Above: Just three of the many fine Wollensak tape recorders available. 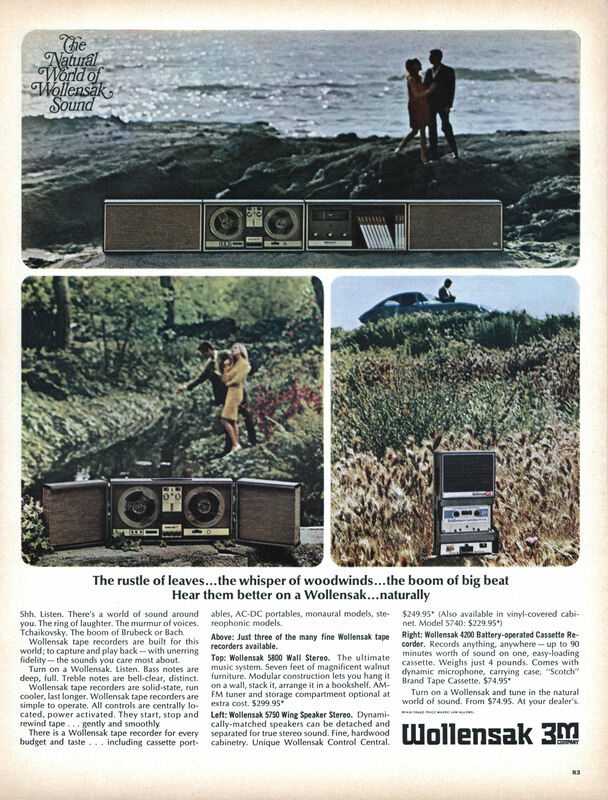 Top: Wollensak 5800 Wall Stereo. The ultimate music system. Seven feet of magnificent walnut furniture. Modular construction lets you hang it on a wall, stack it, arrange it in a bookshelf. AM-FM tuner and storage compartment optional at extra cost. $299.95* Left: Wollensak 5750 Wing Speaker Stereo. Dynamically-matched speakers can be detached and separated for true stereo sound. Fine, hardwood cabinetry. Unique Wollensak Control Central. $249.95* (Also available in vinyl-covered cabinet. Model 5740: $229.95*) Right: Wollensak 4200 Battery-operated Cassette Recorder. Records anything, anywhere —up to 90 minutes worth of sound on one, easy-loading cassette. Weighs just 4 pounds. Comes with dynamic microphone, carrying case, “Scotch” Brand Tape Cassette. $74.95* Turn on a Wollensak and tune in the natural world of sound. From $74.95. At your dealer’s.